Let Mr. Butterflies create your Monarch butterfly release experience! Sherrie from Rosemont, MN wrote us about her Funeral Butterfly Release. "Thank you so much for making our mother's funeral service something we will never forget. Your customer service is amazing!" Stephanie from Arkansas, wrote to thank us for her butterfly Release. "The Monarch Butterflies arrived on time.. Cool.... Alive... And I can't thank you enough.... The envelopes are lovely.... My mom will adore them... And YOU and your hubby made it happen.... Much love to you both.... From mom & I...  !" 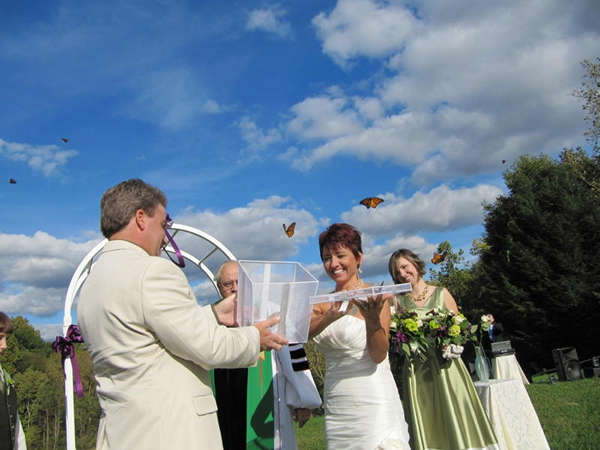 Lindia from Laural MD wrote us about her Wedding Butterfly Release. "All of the butterflies for my wedding arrived safe and sound. The release went beautifully, with rave reviews from the guests. Thank you so much for allowing me to add this beautiful tradition to my wedding." Order EARLY for your 2019 EVENT and SAVE 15% or MORE! Are you trying to decide between Monarch Butterflies and Painted Lady Butterflies? If the answer is yes, please read this. Monarch Butterflies have an average wingspan between 3 3/8 - 4 7/8 inches while the Painted Lady Butterfly has a wingspan between 2 - 2 7/8 inches. Monarch Butterflies are a Vibrant orange color while Painted Lady Butterflies have more black and brown coloring. Monarch Butterflies do much better than the Painted Lady Butterflies during shipping. During the butterfly release Monarch Butterflies are friendly and fly gracefully, while the Painted Lady Butterflies quickly flutter away. Yes, Monarch Butterflies cost a bit more than Painted Lady Butterflies, but then you get a much larger Butterfly. 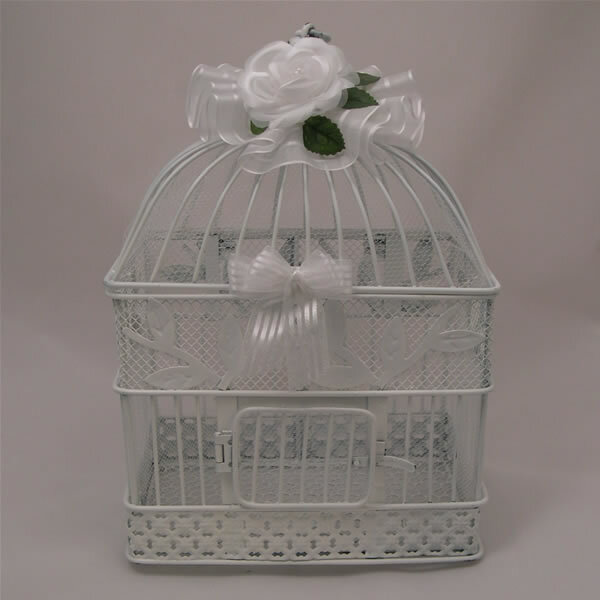 The butterflies load through the small door in front and the entire dome top lifts up for a truly breathtaking release. 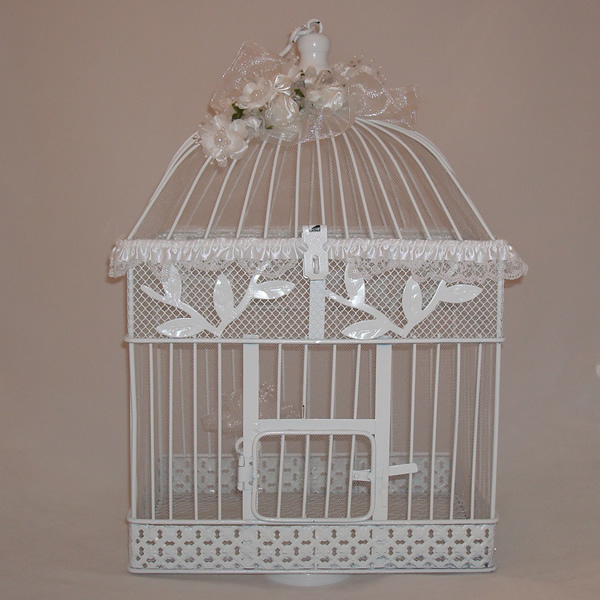 50 Monarch Butterflies and one stylish Large Wedding Butterfly release cage. This is the Ultimate presentation. Place them on the Gift table or near the guest book for your guests to enjoy. This item must be ordered ONLINE at least 3 weeks before the event. ordered less than 21 days before your event. 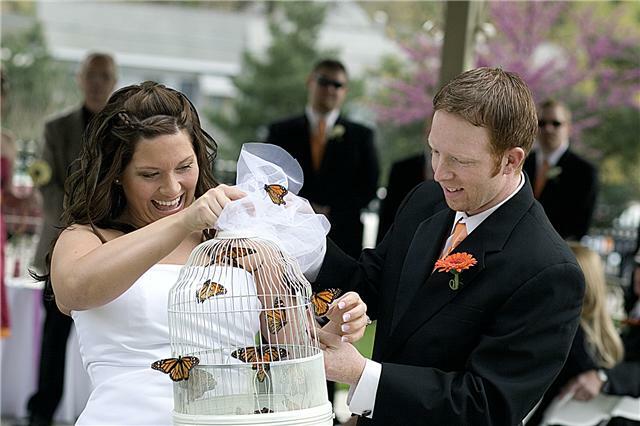 Magical Moments, with Monarch Butterfly Releases At Your Special Event. Set your hopes and dreams free into the air with magical butterfly releases from Mr. Butterflies. Releasing our Monarch butterflies provides a breathtaking moment for any occasion, whether for a joyous wedding, or even at a time of somber reflection during a funeral or memorial service. Our live Monarch butterflies are guaranteed to arrive healthy and ready for release at your event. For your peace of mind, we’re members of the International Butterfly Breeders Association, the Association for Butterflies, and the Better Business Bureau, and have provided butterflies for release at thousands of occasions across Texas, Illinois, and beyond. Our large and majestic Monarch butterflies will soar gracefully from their container to make your celebration or other event an emotional and unforgettable one. Mr. Butterflies began over twelve years ago as a butterfly garden created by a husband and wife. Over time, we found ourselves true butterfly farmers, committed to providing these lovely creatures to our friends at weddings, birthdays, memorials and more. Our business has expanded to supplying all the states east of the Rocky Mountains with these gorgeous, stately Monarch Butterflies, the perfect complement to your important ceremony. Affordable, guaranteed and shipped quickly and efficiently, a butterfly release ceremony will bring smiles and tears of joy to your family and friends. 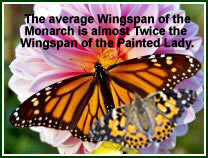 The Monarch Butterfly is nearly 3 times the size of the Painted Lady Butterfly. It takes 3 times as many Painted Lady Butterflies to get the same effect as releasing Monarch Butterflies! Monarch butterflies fly gracefully, unlike Painted Ladies that flutter fast (this makes it very difficult to get a photograph of the Painted Lady during a release).